Absolutely amazing - she writes similar to NORA ROBERTS! This beautiful, emotional story absolutely captured my heart! 😍😍😍 What started with 3 horrible, gut wrenching chapters that had me crying, turned into something so perfect and heartwarming, that it must a Natasha Madison book!! I had so many emotions while reading this story, sadness, heartbreak, tears, anticipation, laughter, angst and so much joy!! This story was just so amazing and well done and Hailey and Jensen were such real and down to earth characters who got exactly what they deserved!! I love the happily ever afters that this author is so good at and I adore her writing style!! I cannot wait until Crystal and Gabe’s story!! 5.0 out of 5 starsHooked right from the first page! The depth of emotion and heartbreak that this story starts out with had me crying within the first few pages. Then, knock me over with a feather, I was not expecting the storyline to head the direction it did! Needless to say, I was hooked. Hailey moves away to deal with her pain and get on with her life. Jensen “Walker” isn’t happy about his new neighbour or that she moved into his old house, a house that holds painful memories for him. Two broken people find their paths colliding, but will it bring them to their perfect love story? As soon as I read the synopsis to Perfect Love Story, I knew it was something that I just had to read. The story line intrigued me as it is pretty different then other books out there. To have a marriage, a life, a love that is entirely based on a lie is something so hard to get over. I couldn't wait to find out what happened and if Hailey was ever able to move on. If you have ever been so lucky to read a book by Natasha Madison, then you know that you are in for a real treat. Madison has this ability to draw her readers in with just one swipe of her pen and the flip of a page. Madison does not disappoint in her latest book, as it constantly surprising readers and very refreshing from the other books out there. The story line is beautifully written, allowing for both Hailey and Jensen to get over what they lost and try to move forward with their lives. The dynamics between Hailey and Jensen were like fireworks and as a reader I couldn't wait for them to explode, as you knew it was going to be good. Jensen was so hard on Hailey at first, but the more she was thrown into the mix of his life, the more he was drawn to her. I loved the way Madison wrote the story, as nothing ever felt forced or coerced. The two just naturally fit together like a perfect puzzle .... like a perfect love story. 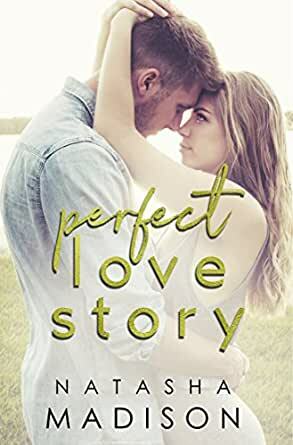 If you are looking for a book that will bring you so much more fulfillment and enjoyment then some of the other books out there, then Perfect Love Story is the book for you. Madison does a great job in creating two characters who just naturally fit and creates a story line that just flourishes their love. I really enjoyed Madison's latest treasure and cannot wait for her next book. Make sure you add Perfect Love Story to your To-Be-Read Shelf. From despair and heartache comes a beautiful love story. I loved Jensen and Hailey's story. They were broken people who each survived betrayal and heartache but needed to build walls as barriers from being hurt again. I loved how Jensen's daughter Mila drew them together despite their opposition to the notion. The love each had for Mila is what allowed Jensen and Hailey to find each other. This was a sweet love story. Wow this is now my new favorite book from this author! Looking forward to reading the next book in the series!